There are a lot of opinions these days about marriage, family and singleness—opinions that are often contradictory and unhelpful. 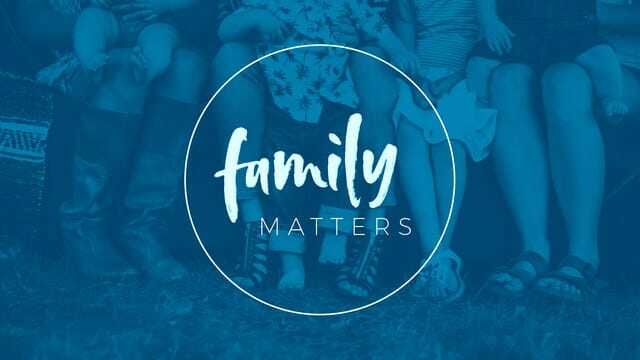 In this series, Family Matters, we will be looking at various Bible passages to help us understand God’s design and plan for some of the most significant relationships we will ever have. Thank you for visiting Chestnut Ridge Church today! You can find out more about our church and upcoming events on our Facebook page or our website. You can also follow the church on Twitter at @chestnut_ridge. For your convenience you may give your offering electronically online or by texting a $ amount to 304-470-4078. Click below to give securely online with your credit card or bank account through our mobile giving site. If you're visiting with us, please don't feel obligated to give. http://theridge.church/familyminpreview May 20 at 9am—Are you new here or simply want to see family ministry in action? Come to the Family Ministry Preview during the 9am service! Hear about the Family Ministry team at The Ridge, and take a look at the Sunday morning environments. If you want to invest time and use your gifts to help others, you’ll be able to find your best fit and start making a difference. Visit theridge.church/familyminpreview. http://theridge.church/familymincelebration Save the date Family Ministry Volunteers!! http://theridge.church/womensgroup A brand new, exciting short-term group for women is beginning May 23rd! Breathing Room will give you the opportunity to connect with others over relatable topics, and to be a part of discussions about living your best life. The group will meet on Wednesday evenings over the course of five weeks. For more information or to register, visit theridge.church/womensgroup. http://theridge.church/couplesgroup Couples are invited to Better Halves, an upcoming six-week short-term group! You’ll have the chance to explore how you can navigate life together, live efficiently, and better your relationship with each other and God. Learn, discuss, grow, and become better together. To register or read more about this group, visit theridge.church/couplesgroup. Problem: Statistics show our kids are straying from their faith. Solution: Parents can play a major role to guide their Christian walk. Parents pass faith onto their kids, but they shouldn’t do it alone. 7 in 10 Protestants ages 18 to 30—both evangelical and mainline—who went to church regularly in high school said they quit attending by age 23. Nearly 6 out of every 10 young Christians disconnect from their churches after the age of 15. How do we pass on Faith? 1. Parents continue to be the single greatest influence on their children’s faith. 2. When a child sees and hears that faith actually makes a difference in Mom and Dad’s lives, they’re much more likely to follow suit. 3. Young adults are more likely to share their parents’ religious beliefs and participation if they feel that they have a close relationship with those parents. "Particularly important, according to our data, is the role of a fathers' warmth. Parental piety--religious role modeling, setting a good example--will not compensate for a distant dad." Ready to take a next step in your personal or group study time? Follow the link below for printable discussion questions about today's message. You'll also find links to this Sunday's audio, video and weekend program. You can watch or listen to past messages online!